Before talking about the aerodynamics of helicopters we first have to introduce a few basic principles of aerodynamics. In order to get aircrafts that are “heavier than air” off the ground a force has to act upwards that is as least equal to the weight of the aircraft. This force is called lift and is created by the wings. Cross sections of wings have a specific shape, the profile. There is a number of different profile types, depending on the desired flight qualities of the aircraft. When a wing moves forward, the profile divides the airstream into an upper and a lower part (Fig 1). Because the air is displaced by the curvature of the profile, it has to cover a “longer distance”, which increases the flow speed. The laws of fluid dynamics (Bernoulli equations) state that the increase in flow speed leads to a reduction of pressure. A “pull” is created on the upper surface of the wing (Fig 2). Because the upper and the lower side of the profile have a different curvature, a different “pull” is created. In case of a symmetric profile (the figure shows a semi-symmetric one) the negative pressure on the lower part of the wing is equal to the one on the upper part. These purely aerodynamic forces are not sufficient to lift an aircraft. The wing has to be slightly bent in the airstream (angle of attack), so that the air is displaced downwards and a positive pressure is created on the lower part of the wing, which increases the total lift (Fig 3). This angle of attack additionally causes an increase in negative pressure on the upper side, because the air needs to cover an even greater distance and is thus accelerated even more. But due to the angle of the wing the air resistance is increased as well, which has to be compensated with a greater propulsion power. Generally it holds that the lift increases with the velocity of the aircraft. But at the same time the air resistance increases as well. For that reason aircrafts that only fly slowly possess thick profiles, whereas for very fast aircrafts slim profiles are sufficient for generation of the lift. However, speed and angle of attack cannot be increased indefinitely, because the airflow on the upper side can stall. This means that the air flows no longer along the profile but forms turbulent flows (Fig 4). At first the turbulences form at the trailing edge. If the angle of attack is increased further, more and more turbulences form in direction of the leading edge until the lift is no longer sufficient to keep the aircraft in the air. This state is known as stall and it mainly occurs when the plane is flying too slowly. As soon as the airflow follows the profile again smoothly the required lift is generated again and the plane is able to fly again. Helicopters are fundamentally different from airplanes. Though aerodynamic forces also play a role for the flight of helicopters they are more difficult to calculate and explain. The main reason is that turning rotors generated additional forces that are not present in the case of planes. In the case of a winged plane the propulsion is delivered either by a propeller or a jet engine (with the exception of gliders). The lift is generated by the wings and the plane is controlled by flaps, rudders and tail units (Fig 5). The case for helicopters is different. The turning rotors create lift, similar to a wing, and accelerate the airflow downwards. This is accomplished by a simultaneous increase in the angle of incidence (the angle between the rotor blade and the helicopters longitudinal axis) and thus also the angle of attack of all rotor blades. This is known as collective pitch. The air is “blown” downwards, similar to a fan, the total lift increases und the helicopter begins to ascend. In order to move the vehicle forwards “only” the rotor plane has to be tilted forwards so that the airflow is slightly “blown” to the back by the rotor (Fig 6). Helicopter flight control works by the same principle. The rotor blade plane is tilted in the desired direction of flight. This sounds simple, but is in truth a very complex aerodynamic process (we will come to that later). Unfortunately, Newton’s third law states that every action evokes a reaction. This results in the hull of the helicopter starting to turn in the opposite direction of the rotor’s direction of rotation. To prevent this from happening most helicopters have a second, vertically turning rotor, the tail rotor, which compensates for this torque (Fig 7). With this tail rotor the helicopter can be steered along the yaw axis while hovering. Designs with two oppositely turning main rotors don’t create torque on the hull, resp. the two main rotors compensate each other. Different from airplanes, helicopters can fly forwards, sideways and backwards and also stan still in the air. This is possible, because the main rotor blades are rotating and thus the air is flowing constantly and delivers the required lift. In the case of a plane the lift is only created when a sufficiently high forward speed has been reached. To explain hovering flight we will, for simplicity’s sake, treat the rotor as a disk instead of examining the forces on single rotor blades. This is possible, because the aerodynamic forces are more or less symmetrically distributed over the rotor disk. In order to keep a helicopter in the air the lift has to be equal to its weight (Fig 8). If now the angle of attack of all rotor blades with collective pitch is increased simultaneously, the downward airflow rate through the rotor disc increases, more lift is created and the helicopter begins to ascend vertically (Fig 9). If the angle of attack is decreased, the total lift decreases and the helicopter begins to descend (Fig 10). Because of the rotation of the main rotor a torque is created, that results in a rotation of the trunk opposite to the rotation direction of the main rotor. This unsolicited rotation is adjusted for by the vertical tail rotor (Fig 11). The larger the power of the main rotor, the larger the torque and consequently also the tail rotor has to be sufficiently powerful to correct the torque. Because the tail rotor creates a horizontal thrust, the helicopter has the tendency to move in the corresponding direction. This direction depends on the rotation direction of the main rotor. This lateral displacement in turn has to be corrected by the main rotor. The airflow, also called downwash, is guided slightly contrary to the direction of displacement so that the helicopter is kept in a stable hovering flight. For many helicopters the forces of main and tail rotors don’t act in the same horizontal plane. For that reason it is possible that the hovering flight is not horizontal but slightly tilted. If it leans to the left or the right is again primarily dependent of the rotation direction of the main rotor (Fig 12). Usually the hovering flight requires more power than the forward flight. An important factor for the capability is the air density. The denser the air, the lesser is the required power and the heavier is the weight that the helicopter can carry. Because the air density decreases with increasing altitude the weight of the helicopter has to be decreased in order to keep it in hovering flight. Generally it also holds that the higher the environmental temperature and the altitude, the smaller the capability of the helicopter. Another factor that influences the capability is the downwash. The state when the airflow can run off unobstructed is called hover out of ground effect (OGE, Fig 13). The state when the helicopter is hovering close to the ground is called hover in ground effect (IGE). The downwash, which has to be run off laterally, creates a kind of air cushion (Fig 14). Thereby the helicopter requires less power for the stationary hovering. The higher the altitude of the helicopter, the smaller is the influence of the ground effect. At an altitude of approx. 1.5 times the diameter of the rotor the ground effect is no longer present. The ground effect is furthermore influenced greatly by the nature of the ground and especially its slope. If the slope is steeper, the downwash can run off better and thus the ground effect is less strong. Arguably the biggest advantage of helicopters is that they are able to both hover in one spot and fly forwards. The transition from hovering to forward flight is an aerodynamically and mechanically exceedingly complex process. For simplicity’s sake we will treat the rotor as a disk instead of examining the aerodynamic conditions at single rotor blades. As has already been mentioned, the rotor accelerates the air downwards during hovering (Fig 15). In order to transition to forward flight, the whole rotor disc has to be tilted forwards. Because of the inclination in the forward direction the air is no longer accelerated vertically downwards, but backwards (Fig 16). Thereby the helicopter starts to move forwards. But because also the lift doesn’t act vertically upwards anymore, the pilot has slightly increase the power during the booster phase to achieve the proper ratio between lift and weight. The rotations of the rotor cause different flow rates to occur at the rotor blades. The rotor blade that moves forwards (in the direction of flight) is called advancing blade, the one that moves backwards is called retreating blade (Fig 17). The advancing blade reaches an effective blade tip speed of 950 km/h (750 +200). This speed is already close to the speed of sound. At the root of the blade a flow rate of over 200 km/h is achieved (Fig 18). The retreating blade on the other hand only has an effective blade tip speed of 550 km/h (750 – 200). The flow rate decreases with decreasing distance to the rotation center. Around the blade root it can even occur that the blade is fed from behind and therefore unable to provide lift in this area (Fig 19). As we know, the amount of lift depends on the flow rate and the angle of attack (apart from the type of profile). To achieve fairly constant lift conditions across the whole rotor disc, the angle of attack has to be constantly changed during a revolution of the blade because the flow rate also changes constantly. This adjustment of the angle of attack is called cyclic pitch. The top forward flight speed for modern helicopters is approx. 400 km/h. Above this speed large parts of the advancing blade would be in the supersonic range and a large area of the retreating blade would be stalled. There is no wing profile, which would be able to cover such a big range of velocities. In order to keep a constant inflow at the rotor blade, the rotor has to run constantly. But what happens when the power – for whatever reasons – breaks down? Because due to the collective pitch the rotor blades have a relatively wide angle of attack during forward flight and produce a correspondingly big air resistance, the revolution speed of the rotor drops rapidly without power. Thereby also the required lift is lost and the helicopter will crash soon. Fortunately, that sounds a lot more dramatic than it is. Similar to the gliding flight of an aircraft, the helicopter has so-called autorotation. If the rotor power breaks down during flight, the pilot will immediately decrease the collective angle of incidence of the blades and the helicopter will begin to descend. 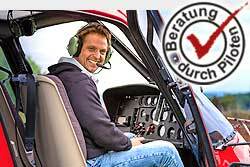 At the same time, due to the reduced angle of attack, the air resistance at the rotor blades will decrease considerably. As depicted in Fig. 20, the air now no longer flows downwards through the rotor but upwards. Because of the aerodynamic conditions, which we will talk about in more detail later, the revolution speed can be kept constant in this state. To explain the events during autorotation, we should no longer treat the rotor as a disk, but instead examine the events at single rotor blades. In order to do this, we will first have a look at the conditions during powered forward flight (Fig 21). For a flight profile the lift always acts vertical to the inflow and the air resistance acts in the same plane as the inflow. Because the inflow of a helicopter consists of a horizontal (revolution of rotor) and a vertical component (airflow from above or below), we speak of a relative inflow in the case of a rotor blade. Because the lateral parts of a rotor blade rotate at a faster speed but the vertical component remains more or less constant, the relative inflow changes gradually over the length of the blade. For that reason Fig 21 is only valid for a small part of the blade. Also the angle of attack (angle between chord and relative inflow) is gradually decreased over the length of the blade from the inside out. To explain autorotation, the rotor will be divided into three areas. For simplicity we will first have a look at vertical autorotation, which occurs when the helicopter is in a vertical descent (Fig. 22). In that case the areas are distributed symmetrically over the rotor disc. Thereby only the propulsive area is responsible for the revolution of the rotor. Close to the center the flow rate is so small, that the rotor blades are in a stall. To explain how these areas come about, we have to examine the aerodynamic conditions at the single rotor blade more detailed. In the propulsive area the total aerodynamic forces act in front of the rotation axis of the rotor. Thus a force that propels the rotor is created. If the aerodynamic forces act exactly on the rotation axis the revoution speed remains constant. In the breaking area the total forces act behind the rotation axis, which means that the rotor is decelerated. All helicopters are constructed such that there is a balance between the propulsive and the breaking areas. This balance has to be ensured for a vertical descent up until a certain forward speed. During autorotation some helicopters are limited in their maximal forward speed. This is because the propulsive area is shifted with increasing speed (Fig 26). This shift always occurs in direction of the retreating blade. If the forward speed is increased further in this situation, the propulsive area is shifted further to the right, which leads to the breaking area being larger than the propulsive area, so that the revolution speed can no longer be kept constant. Usually a certain forward spedd is kept during autorotation. To ensure a safe landing this speed has to be dropped as much as possible. This is done during a flare landing. Close to the ground the pilot pulls the nose upwards, so that the descent is less steep and the speed is reduced. Thereby the rotor can receive more energy (the revolution speed increases) and the helicopter can perform an almost normal landing. This sounds very simple, but is in fact a challenging maneuver for the pilot. As already mentioned, the air is accelerated downwards through the rotor during a stable hovering flight. The airflow rate is not constant over the length of the blade (Fig 27). The vortex or vortex ring state is created when the helicopter is in a descent or a slow forward flight with a high rate of descent. The rate of descent has to be above 500 ft/min (2,5 m/sec) and the forward speed has to be below the so called transition zone. Additionally, the rotor has to be propelled by the motor. This conditions occur mainly during a steep landing approach with tailwind. Due to the rate of descent, a flow of air is created that opposes the downwash (Fig 28). Thereby the air is accelerated downwards in the inner part of the rotor plane, but immediately transported back up by this flow of air (Fig 29). The air is again aspirated from above and thus a closed circuit is created, the vortex ring state (Fig 30). In this state the helicopter begins to descend even faster, even if the power is increased. Altough the helicopter is still controllable, strong vibrations can occur. The first one is to change to forward flight, because then the downwash is dissipated to the back and the rotor can be supplied with “fresh air” from above. This option is used when the vortex occurs close to the ground, e.g. during a landing approach. The second option is to change to autorotation, so that the airflow from above ceases and the rotor is only flown through from below (as in a normal autorotation). In any case the pilot needs to react very fast after the occurrence of the vortex, because due to the enormous rate of descent the altitude can become too low to stop the vortex.